Very few policy makers in India dare to acknowledge the danger to the nation's territorial integrity. The security and integrity of the nation has become hostage to vote-bank politics. Democracy and more than eight percent economic growth will be of no avail if the country as such withers away. India is not only being frayed at its borders by insurgencies, but its very writ in the heartland is becoming increasingly questionable. The rise of a nation is predicated upon unity, peace and stability, which are essentially determined by good governance. The prevailing security scenario poses the serious question -- Is India's development and economic growth becoming unsustainable due to poor handling of the security? There are three dangers to the territorial integrity that bedevil the nation. New Delhi and the state capitals have almost ceded the governmental control over 40 percent of the Union's territory to the Naxalites. The Naxals are aided and abetted by the crime mafia that runs its operations in the same corridor from Nepal to Andhra Pradesh, as well as Maoists of Nepal who in turn receive covert support from other powers engaged/interested in destabilising India. The nexus between the United Liberation Front of Assam and Maoists in Nepal is well established. In a recent attack in Chhattisgarh, Maoists of India and Nepal were co-participants. There are also reports to suggest that Indian Maoists are increasingly taking to opium cultivation in areas under their control to finance their activities. The Maoist-crime-drug nexus is rather explosive. The security forces, primarily the Indian Army, have held the state of Jammu and Kashmir physically since Independence. The politicians and the bureaucrats have contributed nothing to resolve the situation. The danger has since magnified many times as displayed by the presence of thousands of supporters of the Lashkar-e-Tayiba flying their flags in a recent rally of dissidents. Under the garb of peace overtures, heavily armed infiltrators with tacit support from the Pakistan military-intelligence establishment continue to make inroads into Kashmir. They are at present lying low, waiting for an opportune moment for vicious strikes on several fronts to undermine the Indian Union. This ghost force reared its head in a recent rally organised by Syed Shah Geelani. Pakistan and its sympathisers in India are working in a highly synchronised fashion for demilitarisation of the valley. Simultaneously, there is an insidious campaign to malign the Indian Army on one pretext or the other as part of the psywar being waged by the ghost force under Islamabad's directions. After all the wars, export of terrorism, inconsistent and weak policies by New Delhi, Islamabad could not win Kashmir only because the Indian Army held its ground. If the ghost force succeeds in making locals rise against the army, it will be an unprecedented achievement for Islamabad. The talk of demilitarisation and the campaign to repeal Armed Forces Special Powers Act, are therefore merely ploys that aim to achieve the Kashmir objective even as the Pakistan establishment expands its tentacles not only within the valley but in other parts of India as well. While the Pakistan dispensation talks of peace, terrorist cells are proliferating in the country including new frontiers in southern part of India. Islamic fundamentalism/terrorism footprints, as evidenced by the Bangalore-centered incidents, are too glaring to be ignored. Islamic terrorism in the garb of freedom fighting in Kashmir is therefore de-stabilising the entire country. Islamabad is determined to use Kashmir as a gateway/launching pad to rest of India. Given a modicum of political will, Danger-I and II may still be manageable, however, Danger III to its territorial integrity in the northeast may prove to be the most difficult. In fact the entire northeast can easily be unhooked on multiple counts from the Union. First, these are low populated areas having contiguity with the most densely populated and demographically aggressive country in the world, Bangladesh. The country has also emerged as a major source of Islamic fundamentalism which impacts grievously on the northeast. To add to these woes, New Delhi because of sheer vote-bank politics legitimised illegal migration for 22 years through the vehicle of Illegal Migrants (determination by tribunals) Act, 1983. Many border districts now have a majority population constituting illegal immigrants from Bangladesh. In the near future, this leverage will be used to create an internal upheaval against the Centre as in the case of the valley. It's a classic Islamic fundamentalist principle of asymmetric warfare. What cannot be achieved by conventional wars can be done through infiltration and subsequently internal subversion. They call it jihad! Second, the northeast if not addressed appropriately could unhook from the Union before the valley given the acute vulnerability of the Siliguri Corridor, which is merely 10 to 20 kilometres wide and 200 kilometres long. If this critical corridor is choked or subverted or severed by force, the Union of India will have to maintain the northeast by air. With poor quality of governance for which the country is infamous, the local population may gravitate towards other regional powers. Third, with China's claim over Arunachal Pradesh becoming more strident, as evidenced by its recent stance on Tawang, the danger to the Siliguri Corridor stands enhanced. This corridor has been facing internal turmoil for many years. The area may well be further subverted by inimical regional powers. Chinese intention to bargain for Tawang to secure Tibet is deceptive. Subsequently, it would covet entire Arunachal Pradesh to protect Tawang. The Chinese are known for expanding their areas of strategic interests with time unlike the Indians who are in a tearing hurry to convert the Siachen Glacier into a 'mountain of peace' or the LoC into a 'line of peace' or equating Pakistan as an equal victim of terrorism. It is a matter of grave concern that New Delhi is so prone to issue statements without thinking it through, as long as it appeases the adversary even temporarily. 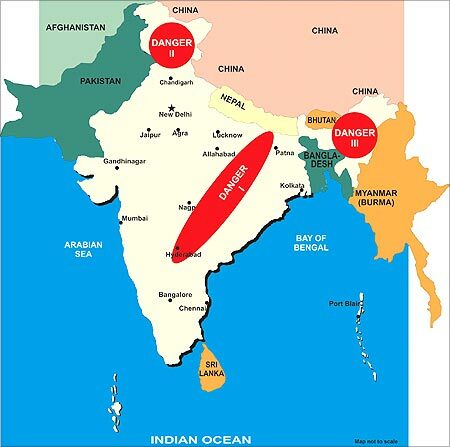 Therefore, the northeast -- with the internal turmoil in the Siliguri Corridor, with low population surrounded by overpopulated Bangladesh exporting Islamic terrorism under tutelage of Islamabad, with China gaining influence in Nepal and Bangladesh and its upping the ante on Tawang -- the danger to the region is grave. Manipur is a stark indicator. The insurgents have nearly weaned the state from the Indian Union. The writ of the Indian Union has ceased to operate; insurgents, compelling people to turn to South Korean music and films, ban Hindi music and films. New Delhi continues to fiddle while the northeast burns which in turn poses a grave problem to the territorial integrity of the Union of India. The world once again is getting polarised into two camps after the end of the Cold War -- democracies and authoritarian regimes of all hues, which includes Islamists, Communists, and the Maoists. Their perspectives are totally totalitarian. Therefore with China, Pakistan, Bangladesh, Myanmar, and Nepal (Maoists), being neighbours, the danger to the Indian territorial integrity stands enhanced.